Basement windows, also known as hopper windows, are a great addition to the lowest level of your home. They have specific features that you won’t get with other window styles that we’ll go over below. Basement windows open in a unique way which is perfect for basements – they’re actually the exact opposite of awning windows. 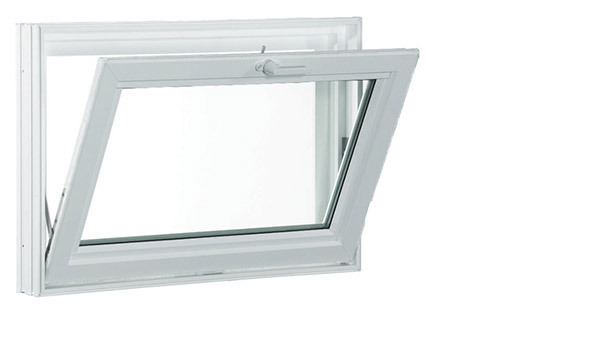 Hopper windows are hinged at the bottom and open into your home. Why is this so important for basement windows? You don’t want a window that opens out from your home for multiple reasons. Since your basement is the lowest level of your home and the windows will be close to the ground, you may scrape the bottoms when you open them. Also, if you have plants or bushes around your basement windows, you don’t want to disturb them. Having a window that opens out from your home would do that. This is why a hopper windows is your best option for the basement. Without windows, your basement would be a dark and dingy area of your home. Basement windows allow natural light into your home. Not only is it scientifically proven that natural light improves mood and productivity, but it’ll prevent you from relying on artificial light when you’re in the basement. Feldco’s basement windows are made to be energy efficient. They have double pane, argon gas-filled glass which prevents drafts from getting into your home through the glass. Don’t worry, the frames are insulated too. They’re foam-filled which prevents heated and cooled air from escaping your home. This helps you regulate the temperature of your home, making it comfortable no matter the temperature outside. More importantly, energy efficient basement windows help you save money on your energy bills. Since heated and cooled air are trapped in your home, your furnace and air conditioner won’t have to use as much power reaching your desired temperature. This ends up saving you a lot of money on your electric and heating bills. Having great window installation is just as important as finding a great basement windows and Feldco knows this. That’s why all of our windows are installed by factory trained and certified professionals. We want to take the stress out of your replacement window project. Get a free quote now and we can get started on your project today.